Applebee's is an all-American restaurant serving great starters like boneless buffalo wings, crunchy onion rings, salads, and mozzarella sticks. Meals served up include cheddar jack mac and cheese, shrimp, oriental chicken salad, bacon cheeseburger, sirloin, chicken, and baby back ribs. 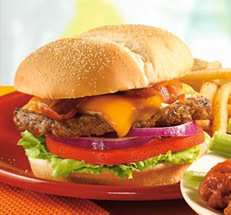 Applebee's is an upbeat, fast-paced eatery with good food and good service. Items on the Weight Watchers menu include tortilla chicken melt, onion soup au gratin, teriyaki steak 'n shrimp skewer, Italian chicken and portobello sandwich, steak and portabellos, grilled chicken salad, cajun lime talapia, and confetti chicken. Apple's also offers Pick 'N Pair lunch combos with over 60 different combinations from which to choose: salads, sandwiches and pasta, and soups of tomato basis, French onion, broccoli cheese, and soup of the day.